From very early on, it was obvious that if Shailene Woodley managed herself well, and refused to follow in the path of many child stars, she had the talent to become a top actress in Hollywood someday. After she appeared in the ABC hit series, The Secret Life of the American Teenager, it became almost certain. Today, that truth is starting to manifest itself as she has become one of the best actresses of her generation. From conquering Young Adult films to her recent upgrade to more mature roles, Shailene Woodley has come to stay and fight for her place in the pantheon of great actresses like Diane Keaton, Angela Bassett, and Meryl Streep. At a young age, Shailene has had her name featured in nominations for some of the most prestigious awards in Hollywood, including the Golden Globes. Here are five interesting facts to learn about the actress. Shailene Woodley was born on the 15th of November, 1991 in California, specifically San Bernardino County to Lonnie and Lori Woodley. Though born in San Bernadino County, she was raised in Simi Valley. Before the fame and glamour of being a Hollywood star, the young actress was raised in a humble middle-class family that consisted of a younger brother and her parents. Her father is a school principal while her mother is a school counselor. Perhaps as a result of her parents’ academic profession, Shailene – regardless of her acting commitments – still managed to have standard high school experience, attending Simi Valley High School. She hasn’t attended college and there is nothing to suggest that she will, but other than her high school education, the only other training and skill acquisition she has managed is taking acting classes with Anthony Meindl. At the young age of eight, Shailene Woodley made her television debut when she landed a non-speaking role for Replacing Dad. After it, Shailene did not get an acting job until 2001 when she starred in Crossing Jordan and The District, both of which were Television Shows. Woodley has gone on to star in other television shows and films, delivering performances that have earned her a name as one Hollywood best young stars. Some of those projects include The Secret Life of the American Teenager, The Descendants, The Fault in Our Stars, Big Little Lies, Snowden, among many others. These performances have earned her nominations for awards like the Emmy, Golden Globe, and MTV Movie Awards. Woodley speaking during a rally on Dakota Access Pipeline August 24, 2016. 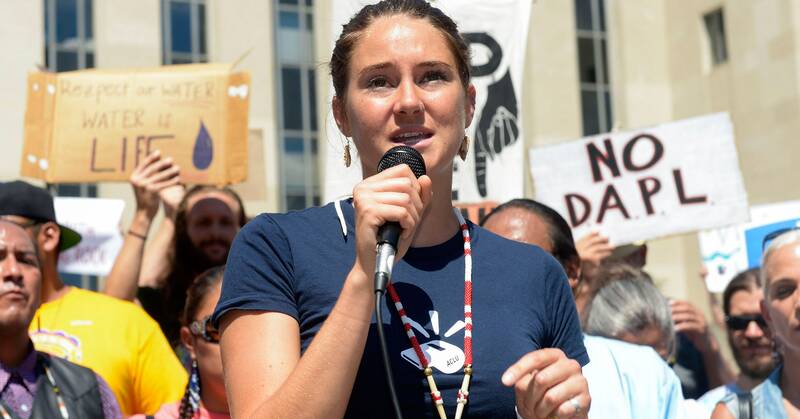 Perhaps the most important fact to learn about Shailene Woodley is her activism. While most actresses are happy to simply enjoy the prestige and glamour of their profession, the California native is an environmental activist is who has shown she is prepared to risk her career for her cause. She was arrested in 2016 for trespassing while she protested the Dakota Access Pipeline and she and her mother have established a non-profit organization called All it Takes. Shailene’s career in the entertainment world began at the age of four when she became a model for age-targeted fashion products. It was the beginning of a life that would forever be spent in the spotlight. She transitioned to acting at the age of 8. If not for the wonder and advancement in modern medicine, perhaps our big screens would not be blessed with the talents of Shailene Woodley who was diagnosed with Scoliosis at the age of fifteen. She had to be placed in a chest-to-hips brace that prevented her spine from curving further, this probably would have taken her attention away from acting had it not been corrected on time. Although she’s physically white, Shailene’s ethnic ancestry tells a more diverse story. She is of English, African American, Creole, and Swiss descent. In perhaps a further confirmation of the flaws in gender stereotype, Shailene Woodley does not fit into the stereotypical expectations of a young lady, proving once again that it is wrong to place people in boxes. She loves sports, especially basketball. She is not a fan of makeup and hardly dresses to dazzle. According to the actress, she prefers living a simplistic lifestyle.